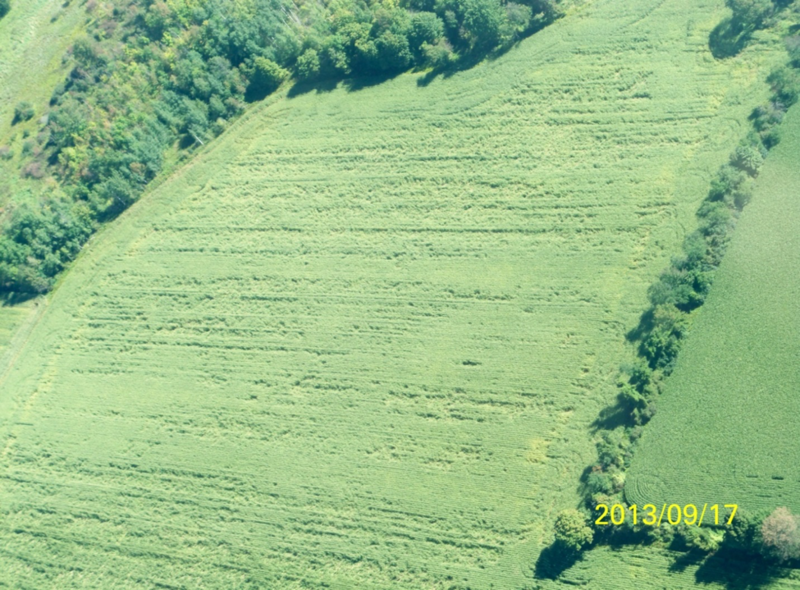 Conventional soybean (right) had virtually no weeds in 2017 with a single application of Roundup. Organic soybean (far left-middle area are 4 border rows between conventional and organic) had relatively few but fairly robust weeds. We initiated a 3-year study at the Aurora Research Farm in 2015 to compare different sequences of the corn, soybean, and wheat/red clover rotation in conventional and organic cropping systems under recommended and high input management during the 36-month transition period (2014-2017) from conventional to an organic cropping system. We provided a detailed discussion of the various treatments and objectives of the study in a previous soybean article (http://blogs.cornell.edu/whatscroppingup/2015/09/16/emergence-early-v2-stage-plant-populations-and-weed-densities-r4-in-soybeans-under-conventional-and-organic-cropping-systems/). This article will focus on 2017 yields, the first year that organic soybean would be eligible for the organic premium. We applied Roundup (Helosate Plus Advanced) on June 21 at ~32 oz. /acre for weed control in conventional soybean (V4 stage) under both recommended and high input treatments. The high input soybean treatment in the conventional cropping system also received a fungicide, Priaxor, on August 2, the R3 stage. We used the rotary hoe to control weeds in the row in recommended and high input organic soybean at the V1-2 stage (June 2). We then cultivated close to the soybean row in both recommended and high input organic treatments at the V3 stage (June 12) with repeated cultivations between the rows at the V4-V5 stage (June 22), the V5-V6 stage (June 28), the R1 stage (July 5), and the R2-3 stage (July 20). We estimated soybean plant densities in all treatments at the V2 stage (June 2), just prior to the rotary hoeing operation. We then estimated soybean plant densities at the V2-3 stage (June 12), just before the first close cultivation between the rows, to determine the extent of rotary hoe damage to soybean. We estimated weed densities at the R4 stage (August 14th) by counting all the visible weeds along the 100 foot plot across the entire 10 foot plot width. We harvested all treatments on September 26 when conventional and organic soybean averaged ~11.0% moisture. 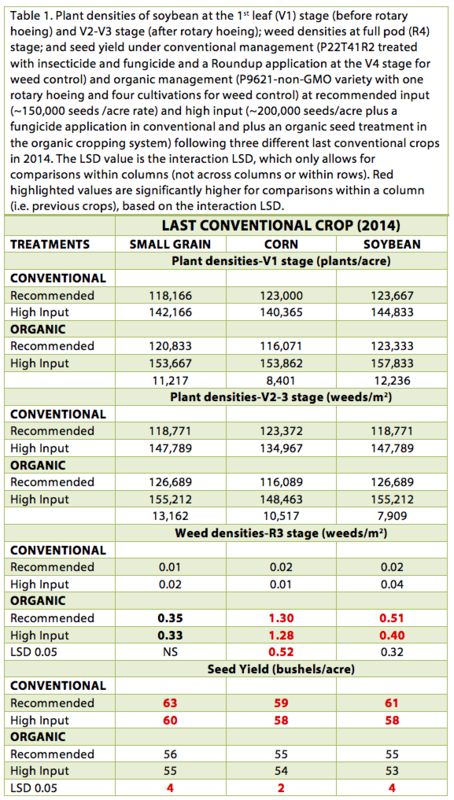 Organic vs. conventional soybean densities averaged ~4.25% higher at the V1 and V2-3 stages (Table 1). As mentioned in a previous article (http://blogs.cornell.edu/whatscroppingup/2017/06/06/soybean-emergence-and-early-plant-densities-v1-v2-stage-in-conventional-and-organic-cropping-systems-in-2017/), we attributed the differences in plant densities to different varieties as opposed to different cropping systems. Weed densities were exceedingly low in conventional soybean, which received a timely single application of Roundup at the recommended rate (Table 1). Weed densities were much higher in organic soybean but still relatively low. As mentioned in a previous article, (http://blogs.cornell.edu/whatscroppingup/2017/08/31/low-weed-densities-in-conventional-and-organic-soybean-in-2017/), we did not expect the higher (than conventional) but relatively low weed densities in organic soybean to greatly influence yield. Nevertheless, conventional soybean did yield ~8% greater than organic soybean in 2017 (Table 1). This is the first time in the 4-year study that conventional soybean did yield greater than organic soybean. Yield did have a negative correlation with weed densities (-0.52) perhaps because only 1.48 inches of precipitation was recorded at Aurora in August, the R3 to R5 stage in soybean in 2017. Another contributing factor may have been the difference in row spacing between the two cropping systems. In a previous study at the same site (https://scs.cals.cornell.edu/sites/scs.cals.cornell.edu/files/shared/documents/wcu/WCU20-2.pdf), 15-inch soybean yielded 8.5% greater than 30-inch soybean. High input soybean did not yield greater than recommended input soybean in the conventional cropping system (Table 1). The conventional treatment was planted at 200,000 seeds/acre and received a fungicide application at the R3 stage. 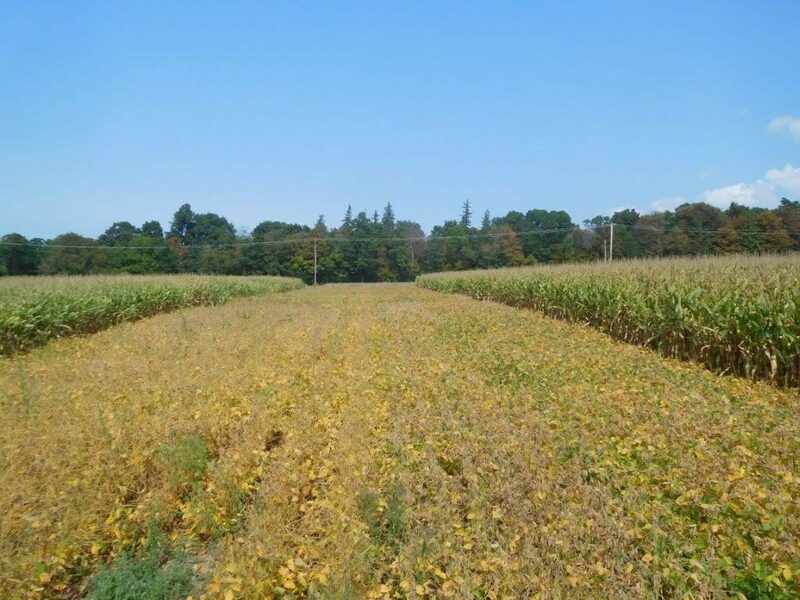 Unlike 2015 when August conditions were dry (1.36 inches) and the fungicide application may have improved plant health, leading to an 8% yield increase (http://blogs.cornell.edu/whatscroppingup/2015/11/09/soybean-yield-under-conventional-and-organic-cropping-systems-with-recommended-and-high-inputs-during-the-transition-year-to-organic/), the fungicide application did not increase soybean yield in 2017. As in numerous other studies, we did not observe a yield increase with seeding rates at 200,000 seeds/acre compared with the recommended 150,000 seeds/acre in conventional soybean. As in previous years, the high input (200,000 seed/acre seeding rate and organic seed treatment), and recommended input (150,000 seeds/acre) treatments in organic soybean yielded similarly (http://blogs.cornell.edu/whatscroppingup/2016/11/28/organic-soybean-once-again-yields-similarly-to-conventional-soybean-during-the-second-transition-year/). Some organic growers plant soybean at higher seeding rates to help control weeds. Weed densities were similar between the high and recommended input treatments in organic soybean so yields were once again similar for the 3rd consecutive year in this study. In conclusion, conventional soybean yielded 8% higher than organic soybean for the first time in the 3rd year of this 4-year study. Organic soybean, however, would be eligible for the organic premium this year because 36 months have elapsed since the last application of synthetic fertilizer or pesticides on the fields used in this study. Consequently, organic soybean, despite the 8% lower yield, would be more profitable to the transitioning organic soybean grower in 2017, especially at the recommended 150,000 seed/acre seeding rate and no organic seed treatment.